"Oh My" by JT Steiny was the final exhibit at Daniel Rolnik Gallery's Pasadena location. JT is an artist who is always working in series, so I'm always watching his instagram page to see what stream he's on and if I can show it. 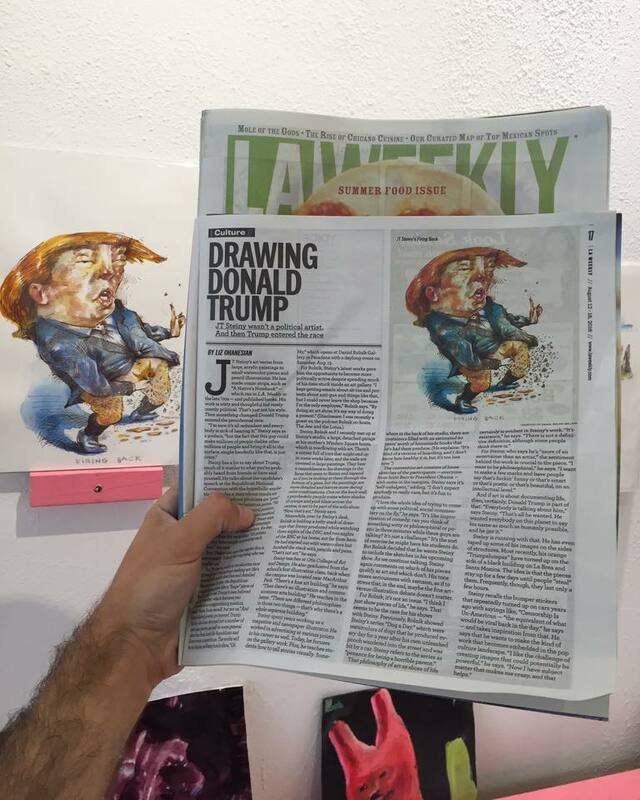 The 2016 Presidential campaign was really heating up and he was doing a whole anti-Trump series of work that I thought would be spectacular to exhibit in the gallery. What I liked most about the show was that JT and I were not political, we both liked the circus surrounding the political stuff, so it was really all about the art. And LA Weekly published a whole story about it as well as Print Magazine, which was epic. A team from reuters news even came out and interviewed us. I asked them where is was showing up and they told me thousands of news channels across the world - though, I never saw it. It was still pretty fun. I couldn't decide on how to frame JT's drawings, so I cut up little pieces of wood and drilled them into the wall so the unframed works could rest on them. We also had a selection of JT's mail art on exhibit as well as his cups, pillows, and books. But, before the show even opened, I had managed to piss off the city, neighbors, and more with a simple art walk that you can read more about HERE. Read more (August 2016) articles, HERE.